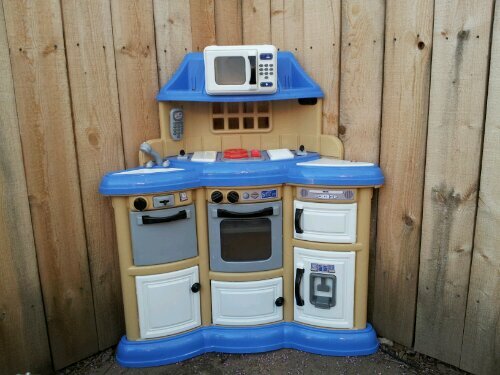 A few weeks ago Donna and I made the mistake of telling her parents that Russell just lovesthose toy kitchens. They got him one for his birthday; it was a nice-looking blue one. I decided yesterday to get it out of the box and set it up for him in the backyard. Two hours later, I finally finish putting the horrid thing together. If you’ve ever put together a model car, you’ll have an idea of how this thing worked. It seemed like a thousand tiny pieces all attached to each other by plastic. I had to cut each piece out with wire cutters. Busy Saturdays… Oh how I love them! We’re going to be going to a livestock show in Frederick to watch my nephew show a pig… I remember the days; hopefully it’s more entertaining as an adult! Before we go there we’ll be heading over to the book fair at MSU. Hopefully I’ll find a good book or six there. Just in case the show is boring ;).